The Pursonic Airfryer makes it possible to enjoy healthier versions of your favorite foods by frying them with a tablespoon or less of oil and draining excess fat during cooking. Air circulation technology circulates air around the entire unit, heating up to 390 degrees to ensure all food is cooked evenly throughout. Food becomes crispy on the outside and tender on the inside with little to no oil. 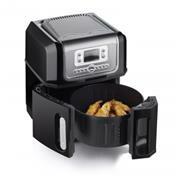 Now you can join the nations new trend to eat and live a healthier lifestyle with the afforadable Pursonic AirFryer.